It took a while, but we've finally arrived. We're in the midsummer doldrums, that long slog in July when the weather is kinda boring. There's lots of weather across the country this week, but none of it is particularly exceptional or exciting. It takes a true weather buff to find joy in a pattern like this. It's there if you look hard enough. There isn't so much as a whisper of tropical activity in the Atlantic Ocean right now. The remnants of Hurricane Beryl regenerated over the Gulf Stream this past weekend as a subtropical storm—so called because it derived some of its energy from upper-level winds instead of solely from thunderstorms around the center of circulation. Beryl's regeneration was nothing more than a novelty to gawk at from afar. The most interesting thing coming across the Atlantic lately is Saharan dust that's lowered air quality and led to hazy skies across Texas. Each puff of dry, dusty air that crosses the Atlantic makes the environment inhospitable to tropical development. 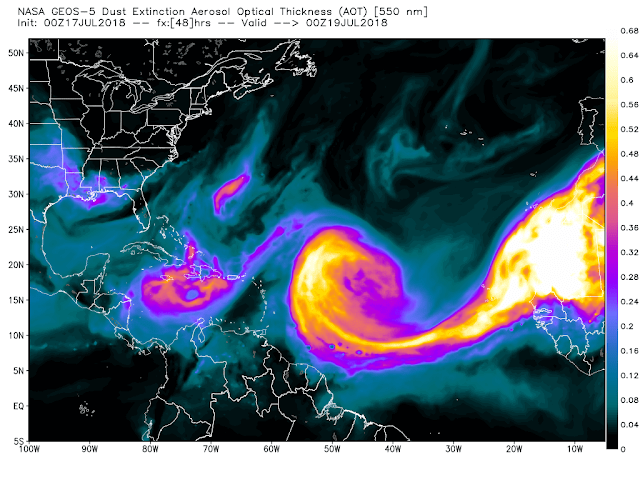 You can watch the progression of Saharan dust on weather models. A cold front marching toward the East Coast tonight will bring drier and slightly cooler air the the Northeast and Mid-Atlantic through Thursday. It won't be nice enough to throw the windows open (maybe up north at night), but it'll be a nice, short break from the nonsense we've been dealing with over the past couple of months. Southerly flow on the west side of the Bermuda High—a persistent ridge of high pressure over the western Atlantic Ocean—will steadily feed warmth and mugginess into the southeast even as the cold front presses south and stalls out. The influx of tropical air will slowly push back against the front this weekend, winning out over the unseasonably dry air and helping return much of the east back to its muggy ways. The end result is a daily chance of heavy showers and thunderstorms. 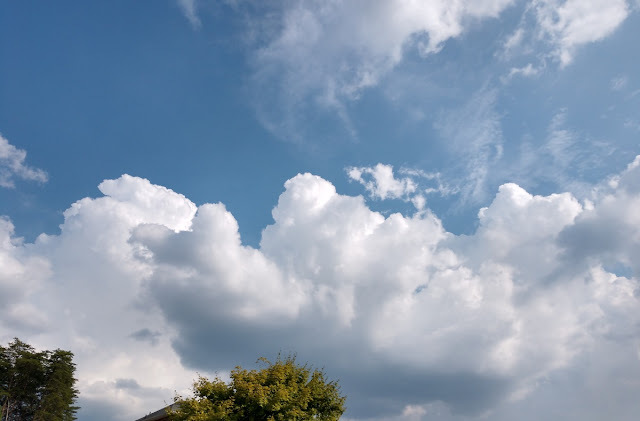 They'll be your typical summertime thunderstorms—a few storms pop up, rain out, and more storms form along their outflow boundaries. It's very hard to say exactly where one storm will pop up. It's hit or miss. Some of the storms could grow strong enough that they produce damaging wind gusts or flash flooding. The coolest thing about these storms is watching them bubble up and fizzle out on weather radar. A couple of storms in southwestern Tennessee formed in just the right spot for NWS Memphis' radar to pick up the fine details of the storms and their outflow boundaries. You can see the cool air of the outflow rippling away from the storm like waves on a pond as the thunderstorms rain themselves out. These boundaries can act like mini cold fronts, digging into unstable air and triggering new thunderstorm development. The only reprieve from the July heat in the south is sunset, and that's not even a sure bet some days. A strong ridge will keep the southern Plains particularly toasty this week. The 100°F+ heat will continue through next week across Texas and Oklahoma. 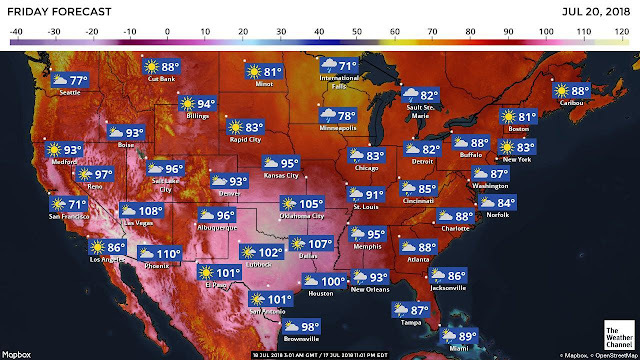 It's not uncommon to reach the triple digits in this part of the country. 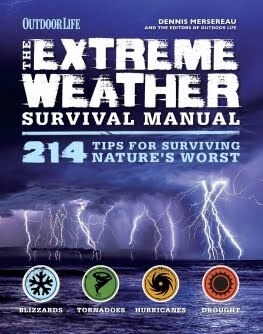 Dallas typically records 20 triple-digit days in a year, 14 such days in Austin, 11 in Oklahoma City, and just a couple each year in Houston where it's much more humid but somewhat cooler due to the influence of the water. It's pretty dry out west. Much of the West Coast and interior mountain regions have slipped into some sort of rainfall deficit over the past couple of months. 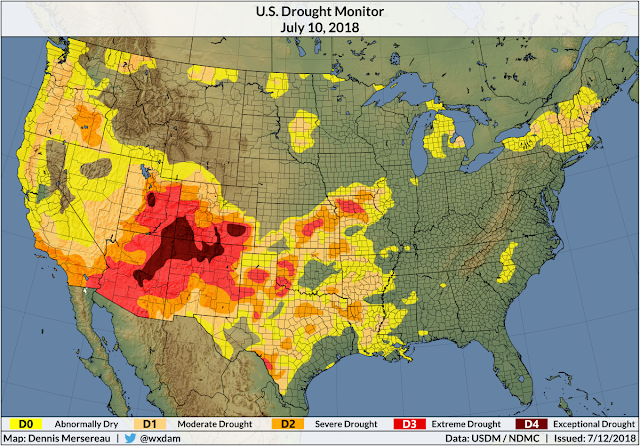 The worst drought is in the southwest and southern Rockies where some areas have reached "exceptional drought," the worst category on the weekly U.S. Drought Monitor. The good news for some of the hardest-hit areas is that the monsoon is kicking in. The monsoon is a seasonal pattern change that brings moisture and rainfall to the American southwest in July and August. This is typically the rainiest time of the year for cities like Phoenix, where they usually see a few inches of rain between the beginning of July and the end of August. The extreme heat in Texas and Oklahoma will contribute to worsening drought conditions over the next few weeks. The most significant bouts of rain in the southern Plains this time of year comes from landfalling tropical systems; lacking those, the bulk of summer's rain comes from pop-up thunderstorms and squall lines moving in from the north. Why Are Summertime Thunderstorms So Intense?